The solar efficiency leader holds steady in its strategy and resolve. 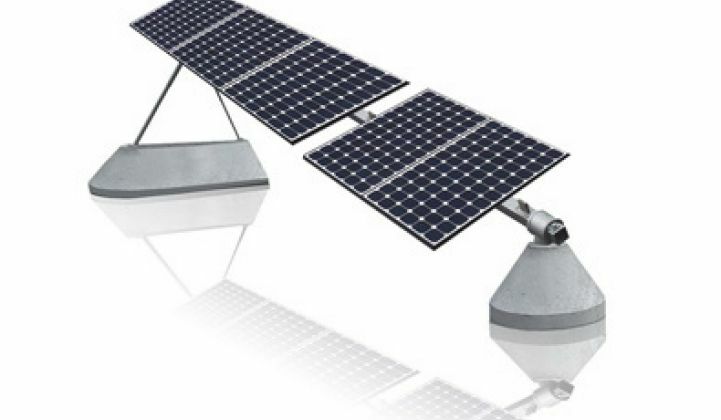 SunPower (Nasdaq:SPWR) reported its Q1 2012 results after the closing bell yesterday. Greentech Media spoke with SunPower CEO Tom Werner soon after the earnings call. The firm posted Q1 revenue of $494 million and gross margins of 12.7 percent. The firm, like every other solar module firm in Q1, lost money. In SunPower's case, Q1 saw a loss of $74.5 million. 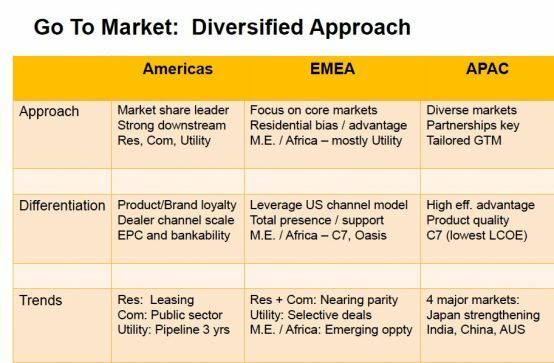 SunPower maintains its global leadership in energy efficiency, is touting the potential of its C7 low-concentration tracker product, and still has the massive liquidity of Total behind it. The firm would not disclose its shipment record on the C7 tracker product (see video below). As we reported last month, SunPower announced, as part of a cost reduction initiative, that it will "re-purpose" its Fab 1 operations in the Philippines and look for tenants for that site. Manufacturing will be consolidated in Fabs 2 and 3 with the intent of of incorporating a new process that reduces the number of manufacturing steps. As we also reported, SunPower "expects to achieve its cost goal of approximately $0.86 per watt, on an efficiency-adjusted basis, exiting 2012." With the downstream sector of the solar market one of the bright spots in a difficult market, SunPower noted that its "residential leasing program continued to gain momentum." Werner told Greentech Media that the number of customers for its solar lease had doubled in this quarter with 4,500 leases signed since the program was initiated in Q3 2011. Ben Kallo of Baird Investment Bank saw the Q1 results as "better than expected" and driven by positive action in the U.S. with a margin that beat consensus. There is still lack of visibility on margin in 2012. 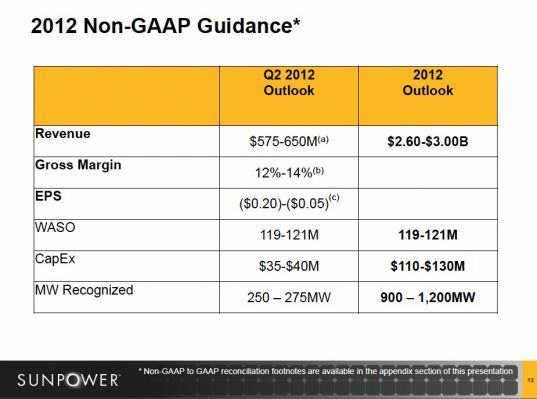 SunPower re-affirmed its guidance for fiscal year 2012. The firm expects revenue of "$2.6 billion to $3.0 billion and megawatts recognized to be in the range of 900 megawatts to 1,200 megawatts," a broad range which indicates the previously mentioned lack of visibility. On a GAAP basis, the firm looks for Q2 revenue of $560 million to $635 million and gross margin of 11 percent to 13 percent. Werner reaffirmed the commitment to a vertical integration strategy that allows the firm "to control its own destiny." 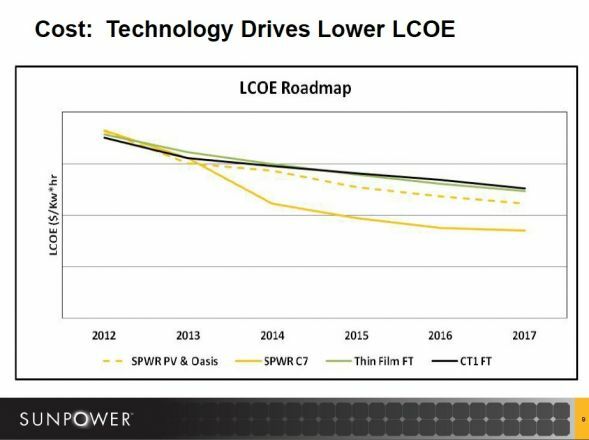 He claimed, as per the investor presentation, that SunPower's C7 low-concentration PV tracker can provide some of the market's lowest LCOE (see chart below), as well as being extremely capital efficient. Installing more than 35 megawatts at the 250-megawatt CVSR power plant for NRG Energy -- on schedule for a 21-megawatt grid connection in September of this year. Commercial production began on the firm's Maxeon Gen 3 solar cell and 21-percent-efficiency PV modules. Despite the losses, perhaps this is indicative of the strategy, balance sheet, and technology differentiation needed to make it through the solar module doldrums of 2012.